View the entire table of contents for the Nov. 15, 2006 issue. Napa Valley is America's undisputed heartland of Cabernet Sauvignon. In terms of quality, production and reputation, this is California's world-class wine, in the same league with the monumental reds of Bordeaux, Australia and Italy. 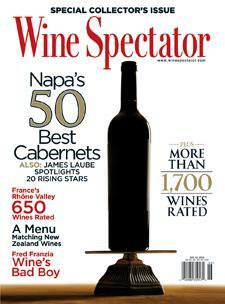 For the full article, check out the new issue of Wine Spectator, on newsstands November 15, 2006.